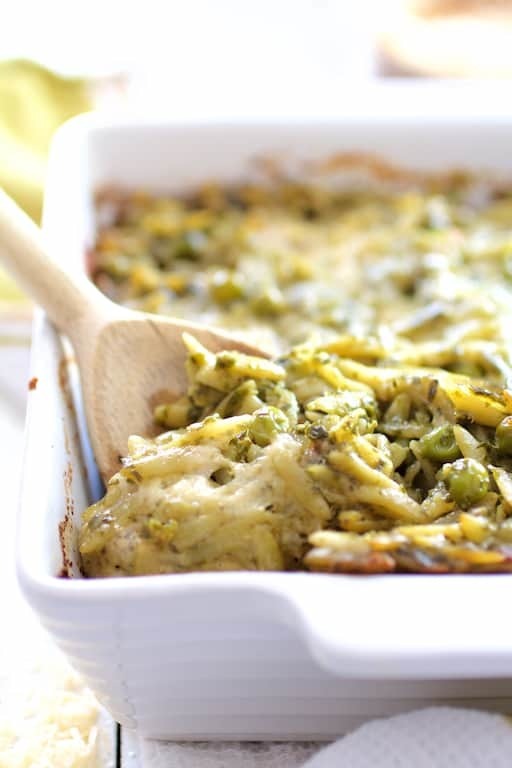 Baked Orzo with Pesto, Peas, Prosciutto and Mascarpone is perfect as a side dish or main dish. Preheat oven to 375 degrees. Spray a small baking dish (like an 8 x 8-inch square) with cooking spray. Combine cooked orzo, peas, prosciutto, cream or half-and-half, pesto, mascarpone and half the Parmesan cheese in a large bowl. Season to taste with salt and black pepper to taste. Transfer to prepared baking dish. Top with remaining Parmesan cheese. Cover with aluminum foil and bake 30 minutes. Uncover and bake an additional 10 minutes or until cheese is lightly browned and bubbling. Let rest 5 minutes then serve.